It is official. This investor loathes Midas of thisismoney.co.uk, net mouthpiece of the Mail and Standard old media stable. For the second time he/she/they have tipped (if that is what doing a mate a favour is called these days) a company your scribe was a Monday afternoon away from taking a stake in. Said shares rose 30% thanks to odd jobbers baaa-ing in. Slightly larger chaps ("enquiring minds want to know") stepped neatly out and and interested onlookers wonder how they might cultivate malleable press contacts (cru classé supposedly). Utter sour, cynical grapes. 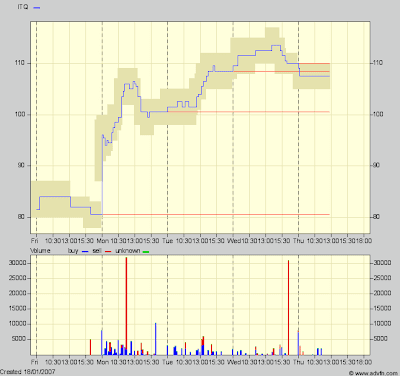 This time it was the dinky recruiter Interquest plc (LSE:ITQ), officially "thisismonied" on Sunday 14 Jan. Graphic result below. The UK recruitment sector is what M&A artistes refer to as fragmented (read: consolidatable, for a fee). It is also on the front line of economic activity making getting into any of them, but especially a single-market specialist like Interquest (IT temps), a cyclical bet. Nonetheless, ITQ’s attractions include: the CEO (Mr Ashworth has done the start-up to sale bit before and as a result has the City contacts and credibility); sound books if one is content with the firm's control of its large factoring requirements (weekly wage expenses being a major cash outgoing); a readily available product (IT grads have the highest rate of unemployment of any discipline in the UK); and, until Friday, equity with a very nice price. Now it is merely OK.
A similar (in financial profile) and still underpriced (a humble opinion) play in the sector is the more diversified (geographically and by business) Empresaria plc (LSE:EMR). The company is more a financial investor in existing, small recruitment specialists than a centrally run, operationally focused outfit. Effectively, it is a cross between a franchiser and a venture capitalist. The theme is let the equity-interested founders of each bit of the portfolio empire run their shops while the center leverages the lot by encouraging cross-selling and knowledge-exchanges, seeks out new business development opps and, crucially in this scribe’s view, manages/optimises the group factoring and invoice discounting policy and practice. EMR too has attractions: the accounts are sound outside the black box of factoring (how about a recourse, non-recourse split with terms for a start?) and fashionable spiel of we-use-adjusted metrics (come on, now - does any board in all seriousness really hang its hat on that? ); earnings growth is historically 25% to 30% and the same is forecast in ’07 and ‘08; the taking of stakes in diversified recruitment firms may end up fitting nicely with these fragmented-consolidating times; international exposure (notably Eastern Europe, India, Japan and Australia) is a diversification bonus; and 35% of the equity is held by three of the Directors. The company is chaired by a recruitment veteran, Tony Martin, which (hopefully) satisfies the know-what-you-are-buying part of their acquisition method. CEO is Miles Hunt, but not the Miles Hunt who sings the theme tune to Underground Ernie on CBeebies. This Mr Hunt is a former company secretary (of caterers F. Bender Ltd) and MBA founder of the Empresaria Group. The author asks Mr Hunt to supply the Midas columnist(s) of thisismoney.co.uk with a couple of cases of 1st crus asap, for his/our firm too deserves to be known of in the tabloid-reading, share-punting public. Or, at the very least, have Underground Ernie spread the word amongst the future job seekers. A trading update is likely by end-Feb with full year results 4 weeks thereafter.